Had the worst night I've had in a long time, maybe even my worst night ever. I just could not get off to sleep. Only managed a couple of hours of sleep. 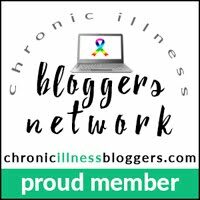 Been feeling low; sometimes the emotional toll of living with a chronic illness (or a few) becomes too much. I had my carer for a couple of hours today and I had some errands to run so we went to Louth to go to the Post Office and pick up some bits and bobs. Louth is not wheelchair friendly at all and today I had my favourite carer. We had some time left so we went for a quick coffee but I ended up having a bunch of myoclonic seizures and a few tonic-clonic seizures but my carer dealt with them amazingly and so calming. I had having seizures in public but it was a stranger fuss-free ordeal. After meds and coffee inside us we headed back to the car and then home. I spend the rest of he afternoon on my bed resting. Mandy was going to dye my hair for me but I was too tired. The seizures didn't stop their. This evening I had a few more seizures so I was feeling quite exhausted and thankfully I got off to sleep better than last night. Still feeling quite low today and got some news I didn't want to hear which I don't feel like writing about just yet. It's nice to have the house to myself again and be in the quiet and being able to go about my day at my own pace. I had my ½ hour Bluebird visit this afternoon. I've managed to do some studying today too. Had my 2hr visit today instead of tomorrow as I'm at Orchard Barn. Not feeling well today. I'm just generally not feeling well and I'm in a lot of pain and fell nauseous and headachy. Despite that I pushed myself to do some studying and I'm making good progress and I've worked out that I can have days off or do less work on days where I'm not feeling great as I've been stressing and pushing myself and days like today getting the work done to the target I set was a struggle. I'm not just about to settle back down to an early night as I'm exhausted. I had my appointment today at Orchard Barn, unfortunately whilst waiting for my taxi to go home I had several tonic-clonic seizures and in the process dislocated my shoulder and hip. The fast response paramedic and ambulance crew where great; they gave me some Entonox and diazepam. My care in A&E was okay too. Mandy was able to come and be with me. I was feeling quite sick so they got me some Iv cyclizine and also some IV paracetamol. I had some x-rays and my hip and shoulder was sorted. I also found out that I had a UTI so I've come home with antibiotics. My blood where bowline okay except my haemoglobin but the Dr just told me to keep taking my iron tablets. Once I got into a room the nurse looking after me was lovely and she remembered me from looking after me in the past. (I've written a more detailed blog post about my A&E visit which you can click here to read. My hairdresser came this afternoon to do my hair. It's little shorter than I wanted but it should grow back. I've also gone for a different colour. This time I've gone for 'Dark Red'. Not had the best evening, but thankfully I had my CareLink. I had a seizure so I pressed my alarm and then when I tried to get up off the floor I fell over again so my CareLink alarm when off again. I decided it was time to head to bed so I settled down and bought 'The Crimes of Grindelwald'. When Dad got home (he was home late tonight) he brought me up a cup of herbal tea. Had a pj morning catching up on snail mail replies. I'm feeling okay knowing I can take time off form college work as I haven't done any for a couple of days.This evening Mandy, Dad and I watched 'The Life of Pets' which was quite funny. Unfortunately I didn't;t quite make it to bed. I had a seizure going upstairs; thankfully I was bum shuffling up like I do now due to me seizures and Dad was just holding me in place to stop me slipping down the stairs even more. Once I came round Dad helped me up to bed. Made it to church this morning. I was shattered when I got home so I've just laid and watched TV. I've managed half a module of work which is better than nothing. Hopefully I can get back on track next week. Symptoms haven't been to great today. I've had numbness and pins and needles down half my left arm again and then there was the PEM this afternoon and then this evening I've had continual myoclonic seizures so after over an hour and a half it was time to take so diazepam and I settled in bed to watch 'Line of Duty' and now I'm about to settle down to bed.